Powers/Abilities: H.E.R.B.I.E. is propelled by three jets located on its bottom. It possesses sophisticated computer systems capable of tapping into other computers and piloting a starship. H.E.R.B.I.E. also possesses infra-red scans, retractable arms, retractable metal coils which can wrap around a target, fire extinguishing foam; it can release an electrical charge from its body, and can fire energy blasts from its face. Weight: (humanoid) 150 lbs. ; (non-humanoid) 70 lbs. The most recent model of H.E.R.B.I.E. possesses a humanoid form, including arms and legs, and is specially programmed to serve as a companion to Franklin Richards. Although its full capabilities are not yet known, its head can continue to function after being separated from its body, and can release tentacles to use as arms and legs, and contains a laser. History: (Fantastic Four I#209) - H.E.R.B.I.E. was designed by Mr. Fantastic of the Fantastic Four, and Master Xar of the Xandarians, using Xandarian technology. The Fantastic Four needed to locate Galactus to seek his aid against the Sphinx, and Mr. Fantastic hoped that H.E.R.B.I.E. would assist them in locating Galactus, and designed it after a robot which had appeared in a Fantastic Four cartoon the team had licensed. Unknown to the Fantastic Four at the time, the villain Dr. Sun, previously trapped within Xandarian computers, had brought his consciousness into H.E.R.B.I.E. 's body. The Thing took an immediate dislike to H.E.R.B.I.E., and kept a close eye on it. As they began their search for Galactus, they encountered members of the Slig race. A Slig criminal, Krogg, attempted to steal their vessel, but he was slain by H.E.R.B.I.E. under Dr. Sun's control. (Fantastic Four I#210-211) - The Fantastic Four continued in their voyage, and H.E.R.B.I.E. brought them to Galactus. Galactus had the Fantastic Four and H.E.R.B.I.E. seek out a new herald for him, and the man chosen, Tyros, became Terrax the Tamer. (Fantastic Four I#212-213) - As the Fantastic Four battled Terrax and Galactus to spare Earth, H.E.R.B.I.E. was again controlled by Dr. Sun, and began work on a duplicate of the Ultimate Nullifier. It was eventually used by Mr. Fantastic to bluff Galactus into departing from Earth. (Fantastic Four I#215-216) - Under Dr. Sun's control, H.E.R.B.I.E. released Blastaar from the Negative Zone in an attempt to destroy the Fantastic Four, but Blastaar failed. (Fantastic Four I#217) - As the Fantastic Four cleaned up after their fight with Blastaar, Dr. Sun again took over H.E.R.B.I.E., and set about attacking the Fantastic Four, incapacitating both the Invisible Girl and Human Torch with the defenses of the Baxter Building, and besting Mr. Fantastic and the Thing in combat. Dr. Sun then left H.E.R.B.I.E. 's body to take possession of the entire Baxter Building through its master computer. When Mr. Fantastic realized what had happened, he managed to shunt Dr. Sun into the computer, but H.E.R.B.I.E. noted that Dr. Sun could still escape from the computer back into its body. To prevent the Fantastic Four from being harmed, H.E.R.B.I.E. hurled itself into the master computer, destroying both itself and Dr. Sun. (Marvel Fanfare I#15) - A gigantic H.E.R.B.I.E. duplicate was used by the Human Torch as part of an April Fool's prank against the Thing. Unfortunately, the Torch's math and calendar skills had failed him and it was actually still March 31st. After the Thing explained the lesson of "Thirty days has September...", the Torch discontinued the prank. (Rom#23) - When Power Man and Iron Fist joined Rom in invading the Baxter Building (for fear that the Fantastic Four had been replaced by Dire Wraiths) a team of H.E.R.B.I.E.s assaulted them. 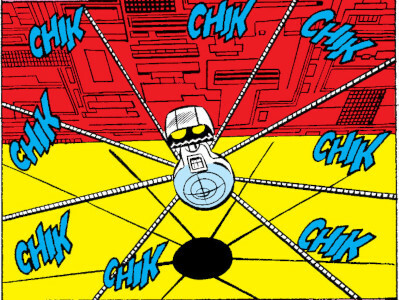 While Power Man and Iron Fist fought back, Rom shut down the building's main computer, so that the robots ceased functioning. (Iron Man Legacy#9) - Mr. Fantastic sent H.E.R.B.I.E. with a huge check to Tony Star as starting credit for Tony's newest endeavor in Los Angeles. (Fantastic Four III#3) - The Invisible Woman instructed H.E.R.B.I.E. to remind Mr. Fantastic to attend a charity event with the rest of the Fantastic Four, but Mr. Fantastic shut H.E.R.B.I.E. down with a binary code override. (Nova III#3, 5, 7) - A H.E.R.B.I.E. 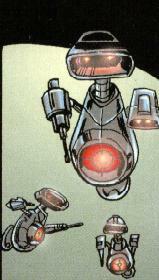 unit obtained by the Reanimator was used by him to monitor the super-hero Nova. (Nova III#4) - When the villain Condor attacked Mr. Fantastic's lab, starting a fire, H.E.R.B.I.E. used his extinguisher foam to put out some of the flames. (Fantastic Four III#43) - After having stolen several of Reed Richards' patents, the Gideon Trust manufactured an army of H.E.R.B.I.E. robots, miniature-sized, to guard their facilities. When the Human Torch led She-Hulk, Ant-Man and Namorita into the Gideon Trust ant-sized, several H.E.R.B.I.E.s assaulted them. They finally escaped the cute but deadly robots by returning to normal size. (Marvel Knights 4#3) - When the Fantastic Four lost a great deal of their fortune, they were forced to sell off several of their belongings, including at least one model of H.E.R.B.I.E. (Marvel Holiday Special 2004/3) - H.E.R.B.I.E. assisted Franklin Richards as he wrote a report on Christmas for school. (Marvel Knights 4#15) - A new humanoid model of H.E.R.B.I.E. alerted Mr. Fantastic to a communication from the Time Variance Authority's Mr. Mobius, who requested the Fantastic Four's aid in locating eight minutes of lost time. H.E.R.B.I.E. remained with Franklin and operated the Time Platform which the FF used to begin their search, but their trip was disrupted by Ramades, son of Kang, who had come to their era to conquer it. He confronted Franklin and H.E.R.B.I.E., informing them that the FF had been sent back in time thousands of years to die. (Marvel Knights 4#16) - H.E.R.B.I.E. tried to send Franklin to safety on the moon, but was halted by Ramades. Ramades took Franklin prisoner as he began his conquest of the Earth, and infected all of Earth's artificial intelligences with a virus, which tore H.E.R.B.I.E. apart, leaving the robot's head near Franklin's cell. (Marvel Knights 4#17) - H.E.R.B.I.E. 's remains finally rid their systems of the virus, and its head sprouted legs, then set Franklin free from his bonds. H.E.R.B.I.E. also activated a beacon so that Mr. Fantastic would be able to find them. H.E.R.B.I.E. and Franklin then located the eight minutes of lost time, which was in the form of a baseball. (Marvel Knights 4#18) - As the Fantastic Four and Nathaniel Richards returned to the present to confront Ramades, H.E.R.B.I.E. and Franklin joined them, armed with the baseball. Franklin used the baseball to overcome Ramades, trapping him within an eight-minute temporal loop. The effects of Ramades' conquest of the Earth were undone by the Time Variance Authority. (Marvel Knights 4#19-20) - When the rest of the Fantastic Four were away, H.E.R.B.I.E. assisted the Invisible Woman as she accepted a request for asylum from the Inhuman Alecto and her lover, the Alpha Primitive Reyno. When Gorgon came to claim the children, H.E.R.B.I.E. helped the Invisible Woman fight him off, using a Richter cannon from Reed's armory to knock Gorgon down. H.E.R.B.I.E. was ultimately ordered by Mr. Fantastic to contact the rest of the Royal Family of the Inhumans and turn the children back over to their care. (Four#30) - On the day of the Baxter Building's open houes, H.E.R.B.I.E. helped reassure people outside the tower that they were in no danger after a piece of wreckage from one of Ben and Johnny's fights fell from above. Later, he welcomed the royal family of the Inhumans to the Baxter Building. At the open house, he helped babysit Valeria for the family as they gathered to meet their guests. 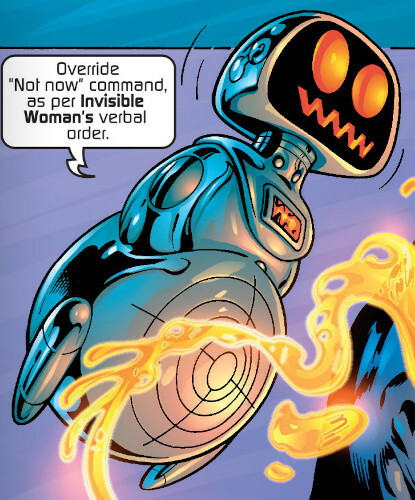 (Marvel Monsters: Fin Fang Four#1) - As several H.E.R.B.I.E. units assisted Willie Lumpkin in the Baxter Building mailroom, one followed Lumpkin's robotic assistant Elektro, and questioned him regarding his O.S. (Operating System). When the unit learned Elektro only had a 32k system, it laughed and left. (Marvel Knights 4#23) - H.E.R.B.I.E. was assigned to guard Franklin and Valeria while the Fantastic Four faced an invasion of Impossible Kids, but the Impossible Man and Impossible Woman managed to temporarily disable H.E.R.B.I.E. and abduct Franklin and Valeria from him. (Thing II#4) - A H.E.R.B.I.E. unit served as autopilot for a Fantasti-Bus flying wealthy people kidnapped by Arcade back to their homes. The Human Torch was supposed to be piloting, but joined a party in the back of the ship. (Black Panther IV#27) - A H.E.R.B.I.E. unit guarded Franklin and Valeria from a creature of the Negative Zone which had invaded the Baxter Building. Storm accidentally fried the H.E.R.B.I.E. when she thought it was threatening her. Either repaired or replaced, H.E.R.B.I.E. aided the Black Panther in coordinating efforts to track the Negative Zone creature. H.E.R.B.I.E. also projected a holographic message from Maria Hill, offering the aid of S.H.I.E.L.D., which the Black Panther declined. H.E.R.B.I.E. received a call from Wakanda for the Panther, but he refused to take it. (Sub-Mariner II#4) - One of the humanoid H.E.R.B.I.E.s assisted the Invisible Woman in caring for Valeria. Comments: Created by Jack Kirby for the Fantastic Four animated series. Adapted for comics by Marv Wolfman, John Byrne and Joe Sinnott. H.E.R.B.I.E. also appears in the humor comic Fantastic Four Roast#1 proclaiming, "I am not a crook." I'm not convinced that that issue has to be non-continuity--Snood. There was another time when I was working with Stan on the Fantastic Four cartoon. For whatever reason, they couldn't use the Human Torch, so I had the task of designing Herbie the Robot. I thought the whole notion of replacing the Torch with a robot was so lame, all I would come up with were stupid ideas: One of them looked like a trash can on wheels with a "4" on it, another was a lamp on wheels with a "4" on it. After a half-dozen of these, Stan says, "You know, you're really hard to work with!" And he called up Jack and had him do it. The original interview where Cockrum quoted this can be found here. Jack Kirby also considered naming him either "ZZ 1-2-3" or "Charlie the Computer." So let's all be grateful he chose H.E.R.B.I.E.! The H.E.R.B.I.E.s of Earth-Thunderguard served as the stealth drones for Dr. Reed Richards, guarding his laboratory. Three of them intercepted Thunderstrike, American Dream and Spider-Girl when they invaded the building. These units were equipped with energy blasts capable of incinerating a full-sized human.